Citizens’ Media TV is currently writing a substantial article on the mishandling of asbestos at Pinelands Regional High School. The article is being written in consultation with high school parents Dane Apgar and Todd Nugent. Apgar has decades of experience in construction management and a degree in business law. Nugent is the president of Synatech Inc., an environmental remediation firm specializing in asbestos, lead, and mold abatement. Nugent is consulting Citizens’ Media TV in his official capacity, not as an individual or parent. To make this upcoming article as solid and irrefutable as possible, we need the assistance of the public. This includes parents, district staff, and even nearby property owners. 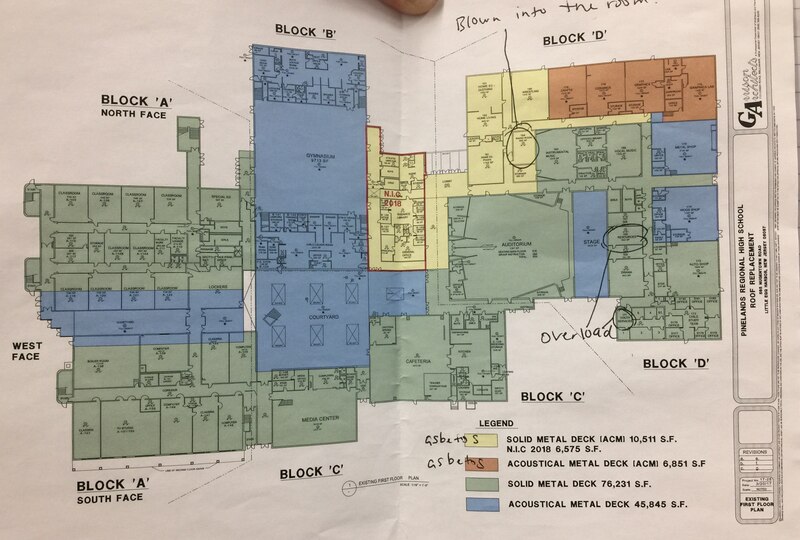 According to Epic Environmental in their September findings, the roof over the close-left corner of the D-wing (when looking at the school from Nugentown Road – the orange section on the diagram) was the primary location of asbestos containing material (ACM) found at the high school. As stated on the diagram, this section is nearly 7,000 square feet. As we understand it, the daycare playground (where asbestos was definitely found) is located approximately under the large “GA” letters near the top-right corner in the diagram. Diagram of Pinelands Regional High School. Asbestos was primarily found in the orange section in the top right corner. Debris or dust was detected outside of district property, such as on the neighboring street, Beloff Drive. Dates and locations of your photographs and videos are critical. Any additional details are of course helpful. Teachers and staff are very strongly cautioned against providing false or hearsay information to anyone in the press or on social media. To be clear, however, there is nothing legally binding that prevents a staff member from publicly sharing information that is 100% truthful and backed up by evidence. Of course, just because the district has no legal basis for this gag-rule, does not mean that staff members will not be retaliated against in some way. That also needs to be considered. If any staff members are willing to talk, even off-the-record, please get in touch. We will honor all requests and do whatever is necessary to make you comfortable and safe. After the article is properly vetted, anyone who contributes information for this article, and if desired, will be given a preview of the final version the day before its released to the public. Previous Post: Editorial (and 2 questions): Even if PRHS Administrator Brennan did exactly as he said, is that acceptable?